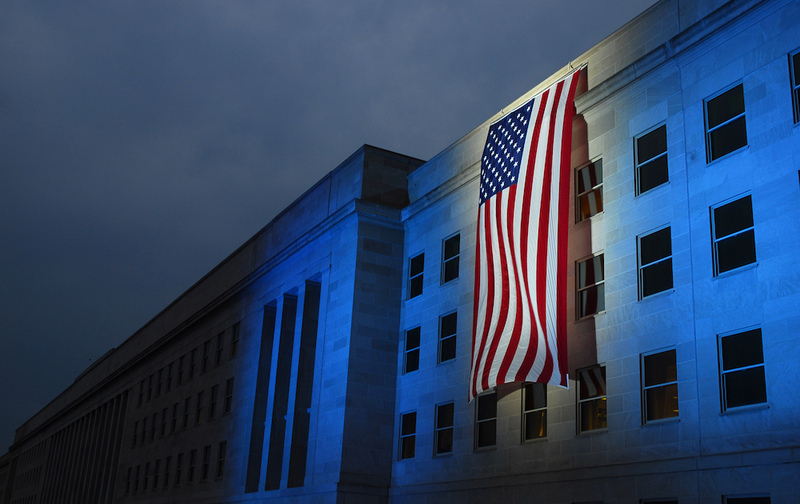 On the sixth anniversary of the Sept. 11, 2001 attacks, a memorial flag is illuminated near the spot where American Airlines Flight 77 crashed into the Pentagon. Photo courtesy of Wikimedia Commons. Is the United States in decline? The debate on the subject lacks both content and context. To take the conversation about American decline away from arbitrary and subjective claims, we require an indisputable criterion. And the only criterion that really counts in international relations is comparison: How does the United States stack up as compared to other powers? By that measure, the United States has been in relative decline since at least the 1960s. Yes, the economic strength of America has grown, and continues to grow, in absolute terms. But its rivals and competitors—China, East Asia, Europe, Latin America—have grown at a stronger and more sustained rate. This is the nature of relative decline: power in the world is a finite quantity (even if power is expanding), so the greater the power of others, the more the power of the United States decreases. Between 1940 and 2014, in terms of gross national product, the United States grew 12.5 times bigger. But the rest of the world has grown 26 times in gross product—more than double than that of the Americans. Much of that gap in growth is from recent decades. In 1987, when Yale historian Paul Kennedy published his famous book The Rise and Fall of the Great Powers (which inaugurated the debate on American decline), the gap between U.S. and global growth was barely perceptible: Since 1940, U.S. GDP had grown six times in size, while the rest of the world’s GDP had grown seven and a half times. This slight difference did not prevent Kennedy from identifying the phenomenon with precision. One can reasonably ask whether the growth differential of GDP can, by itself, give an account of the decline of a country, especially when it is only relative. Many other elements should be taken into account when comparing powers: variable economic factors, such as access to raw materials and their price; transport, research and development, productivity, finance, trade, investment; and then geography, military strength, demography, health conditions, education, the solidity of institutions, political stability. Finally, there are factors that are unmeasurable, but no less important: historical heritage, traditions, social psychology, ideologies, and religions. Paul Kennedy wrote that, in examining the last five centuries of history, some “generally valid” conclusions can be drawn. The first is that there is a relationship between relative decline in economic power and shifts in the international political system. The U.S. situation can be seen more clearly in this historical context. The country, said Kennedy, made “a vast array of strategic commitments” when the nation’s political, economic, and military capacity, as well as its ability to influence world affairs, was more assured than it was in 1987. The United States thus faced what Kennedy called “imperial overstretch,” with its obligations and interests adding up to more than its capacity. That’s a characteristic of relative decline. Kennedy is sometimes dismissed because his predictions of American decline were based on the rise of Japan, and Japan’s rise was later impeded by its decades of stagnation. Still, this doesn’t undermine Kennedy’s historical analysis of decline. In more recent years, other voices have echoed him. In 2008, in its four-year report on international trends, the U.S. National Intelligence Council wrote that “owing to the relative decline of its economic, and to the lesser extent, the military power, the United States will no longer have the same flexibility in choosing as many policy options” as it once had. In writing about relative decline, Kennedy took up again a concept formulated by political scientist Robert Gilpin: that over time, different levels of growth in power within a system eventually cause a fundamental redistribution of power within the system itself. State Department official Richard Haass later used that very same conclusion in order to argue that the United States needed to be ahead of the game so that any “new” balance of power in the world can be balanced from the United States’ perspective. But in the history of the United States, there is also a third possibility for responding to decline, embodied today by Donald Trump: isolationism. Isolationism is not retrenchment, since retrenchment distinguishes between “peripheral commitments” and “core commitments.” Retrenchment is not therefore a matter of abandoning the commitments, but of making choices, however painful, on the basis of a well-defined political strategy. In Henry Kissinger’s words, “to find a sustainable ground between abdication and overextension.” The difference between retrenchment and isolationism is the difference between ordered retreat and a catastrophic rout. Isolationism in the United States today is fueled by fear of worsening conditions. A fundamental misunderstanding of the world has led many people to believe that the United States is being plotted against externally and betrayed internally. But such fears and such misunderstandings are not the product of Donald Trump and his ideologues. Indeed, these fears, particularly around globalization, were cooked up in the intellectual laboratories of the far left in the late 1990s and brought to the public square by the Seattle protestors against free trade in 1999. A matrix of isolationism and petit-bourgeois anti-capitalism has always been found in Jeffersonian democracy, passing through Andrew Jackson, the 19th-century populist movement, and the Catholic critics of the far right and far left during the time of Franklin D. Roosevelt. Trump’s isolationism predates Trump. It’s a product of the end of the Cold War, when many Americans believed the time had come to finally “return to normalcy” and retreat to their island to enjoy the dividends of victory. In the 1990s, the United States refused to sign the Kyoto Protocol on climate change, to participate in the treaty to ban anti-personnel mines and nuclear experiments, or to vote for the creation of the International Criminal Court. Before September 11, George W. Bush was openly isolationist and unilateralist, proclaiming his intention to withdraw the United States from some of the institutions it had created and which had guaranteed the continuity of its world order. September 11 and its aftermath suspended this isolationist tendency only temporarily. The anxieties from the 2008 economic crisis, multiplied by the harmful effects of reckless interventions in Afghanistan and Iraq, have restored it. During the presidency of Barack Obama, the United States adopted 317 protectionist measures on average each year—representing 20 percent of all trade restrictions adopted in the world, almost six times more than the second most protectionist country, India. And during the 2016 election campaign, both candidates called for the withdrawal of the United States from new strategic free trade treaties in the Pacific and the Atlantic. In the future, Americans will no longer be able to afford to live as they have lived in the past. The idea of “making America great again” is absurd. History does not walk backwards. When Americans talk of their greatness, they generally think of a bygone era in which their country dominated the economic, political, and military balances of the world, solitary and undisputed. It also was a time when unparalleled material superiority fueled their alleged moral superiority. Many of the most dramatic mistakes made by the United States during the Cold War derived from exactly this sense of moral superiority, and the corresponding conviction that Americans could shape reality without taking into account the annoying tangible and intangible constraints that exist in the real world. The absence of historical depth that characterizes the American ideology, combined with the rootlessness and the heterogeneity of the population, allows Americans to believe that the recipes that were successfully applied in the past—like deficit spending and protectionism—are reproducible under any circumstances. Neo-Keynesians, for example, argue that they can overturn current trends by restoring the New Deal recipe of deficit spending, as though this were 1929. But public debt has changed with the times. Before the Great Depression began in 1929, the American public debt amounted to 16 percent of GDP. In 1941, it had reached 45 percent; in 2008, during the recession, the public debt was 68 percent of GDP; at the end of Barack Obama’s tenure, it was at 106.7 percent. Today, the United States seeks to make itself great again on credit: In 2017, of the $20.245 billion of debt, almost one third ($6.349 billion) was in the hands of foreign governments—including Beijing ($1.189 billion) and Tokyo ($1.094 billion). In other words, in 2017 China and Japan funded more than 10 percent of U.S. public spending. And yes, while the United States has been protectionist for most of its short history, and had great success under protectionism, that does not mean that today protectionism is a policy that could make the country great again. In a world of more shared power, where growth is based on the exchange of raw materials, financial products, ideas, and people, almost every type of production is linked by a thousand threads to the world market, and breaking one means breaking them all. What gets left out of these protectionist discussions is that now, even the making of a hamburger—which involves cultivation, storage, transport, refining, production, packaging, and distribution—ties together 75 centers of activity from 15 different countries. According to a Boston Consulting Group report from 2017, an attack on NAFTA would be primarily an attack on the United States, given the country’s economic integration with its neighbors. Gordon Hanson of the University of California stated that if NAFTA had not existed, the entire American automotive industry would have already disappeared, swept away by competition from countries with lower wages, social protection, and public deficits. In the future, Americans will no longer be able to afford to live as they have lived in the past. Such a reality has caused disquiet in all countries that once dominated world markets. But the anxiety has been much more intense in the United States, whose brief history has been marked by the promise, almost always maintained, of a constant improvement of the living conditions of most of its citizens. Henry Kissinger wrote that the art of demagoguery consists of the “ability to distill emotion and frustration into a single moment.” But demagoguery cannot solve its problems; it only will aggravate them. In July 1971, when President Nixon took note that the United States was no longer in a position of complete pre-eminence, he was merely stating the obvious: that international relations are always multipolar. The question is the relative strength of the poles of power, and today, the relative strength of those poles is shifting at rapid pace. The distance between the United States and the rest of the world continues to shorten. According to the IMF World Economic Outlook of October 2017, the pace of growth of the so-called emerging countries (4.3 percent in 2016, 4.6 percent in 2017, and 4.9 percent in 2018) is more than double that of the United States (1.8, 2.1, and 2.3 percent). China’s growth is about three times higher (6.7, 6.8, and 6.5 percent). There is no general law establishing how, when—and if—a country in relative decline enters a phase of absolute decline. And theoretically, at least, since decline is relative, it could reverse. Fareed Zakaria has argued that the world is becoming more “post-American” not because of the United States’ failures, but because of “the rise of everyone else.” If China or India or Germany were to enter a deep crisis, the United States could quickly be in a state of relative rise. But that presumes that the United States would not itself be infected by a deep crisis in the other powers. And such a prospect is very unlikely. It is much more plausible that America will continue its relative decline, and will thus be obliged to surrender some of its global commitments and interests, creating imbalances in different places. Of course, things would be far worse if the United States were to withdraw from all commitments and interests in one fell swoop. Manlio Graziano teaches geopolitics and geopolitics of religion at the Sorbonne, the Geneva Institute of Geopolitical Studies, and La Sapienza University in Rome. His books include Holy Wars and Holy Alliance (Columbia University Press, 2017), In Rome We Trust (Stanford University Press, 2017) and What Is a Border? (Stanford, 2018).